Once you become a mom, you will find ways to save or earn additional cash that you can add to your monthly budget. 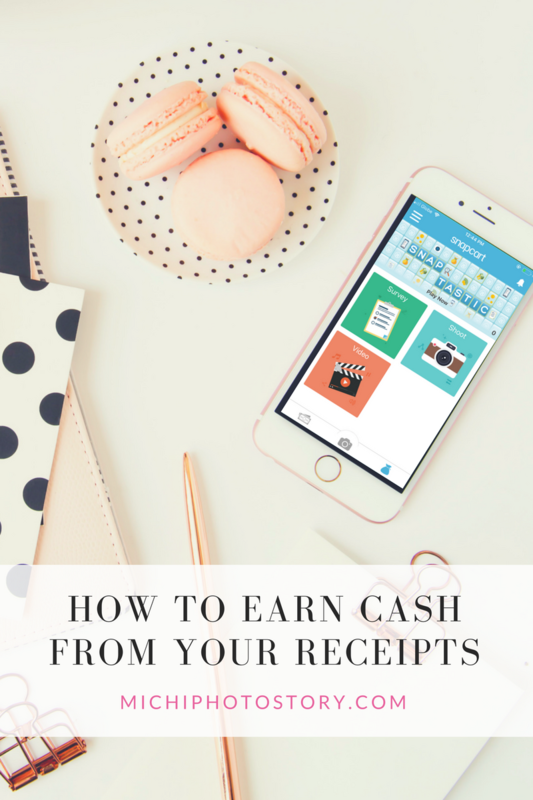 There are so many savings tips that you can read online and different ways to earn extra money and now I’m sharing with you how to earn cash from your receipts. I’m pretty sure that some of you already knew about this app but for those who have no idea about Snapcart, read this post. I’ve learned about Snapcart when I received an invite last year but knowing me, I declined and did not attend the event because it is too far. Snapcart is a mobile application that gives cashback for taking pictures or scanning your receipts. I got excited but unfortunately, it is only available for Android users. Then a few months ago, I’ve read Nilyn's post about it so I immediately downloaded the app. Finally, it is not only exclusive to Android users. 4. Check your email and verify. Note: You need to be connected in order to use the app. I hope they can add more like bookstore. I’m a type of person that always keeps receipts because I always list our expenses (cash or credit card) and just in case I need to return or exchange the item. So if you don’t care about receipts, this time learn to like it. Don’t forget to ask receipts and keep it even for few days because you can earn from it. But don’t ask someone’s receipts or wag mamulot ng mga resibo sa tabi-tabi because there are rules for receipts or baka masuspend pa yung account niyo. So just be honest. 1. Only receipts from products bought by you or someone you live within the same household, in a common shopper behavior. 7. Receipts that are generated by automated cash registers, and are not hand-written or manually typed. Aside from snapping receipts, you can also earn by watching videos, answering surveys, taking photos. Use the coins that you earn in playing Snap Tastic game, where you can win coins or cashback. The cashback that you can earn from your receipt is from P0.50 to P30. I started last July but 3 of my receipts were rejected. Waah! Hindi pa kasi ko marunong magpicture. Ang haba ng receipt ng S&R and pinagkakasya ko sa isang picture, but now I know that I can just click the (+) sign. I only go to the grocery once or twice a month so I know that I cannot earn that much from my receipts. I hope they can increase the cashback tier, sana may additional points pa if P3k, 4k, or 5K above ang receipt. Every time you snap a receipt, you can also increase your level from Regular to Platinum Level. I did not know this before so nadowngrade ko. So now, kahit sa suking tindahan pwede ko na mabili need ko, napapaconvenience store or grocery na ko para sa resibo. If you want to increase your level, make sure you snap at least one receipt per week so the multiplier will increase. Patience is a virtue, right now I already reach the silver level. Once you reach the minimum amount, you can choose mobile load or bank transfer. For bank transfer the minimum amount is P220, P20 is the fee if you choose the bank transfer. For phone credit, you can choose from the following and additional P5 for the fee. I checked my bank transactions and I saw that the P200 was credited to my bank account last November 17 but they only informed me last November 23. Now, they finally replied to my message that my cashout was already completed. Parang kinopya na lang sa notification yung reply. Hehehe! So next time, I will check my bank na lang than wait for their notifications that it was completed. 1. Sometimes it takes them days before approving the receipt so if ever rejected yung receipt, hindi ko na maresend kasi blurred na yung receipt ko or past three days na. Take care of your receipts. 2. There was a time that they rejected my receipt because it is not a GROCERY store. So I reported the receipt and I told them that LANDMARK SUPERMARKET is a grocery store. Iba naman ang receipt pag LANDMARK DEPARTMENT store. Nakakaloka! 3. There was a time that I lost all my COIN REWARDS. I was shocked when I checked my coins and it was ZERO. I log-out and log-in and still it is zero. I just messaged and followed up and finally, after 8 days, my 3633 coins were returned. Lesson learned, use the coin rewards immediately para sure. 4. I thought they will deposit the money after 7 working days but it did not happen and I have to make follow-up pa.
5. There was a time that I answered a survey and the points was not reflected in my account so I have to follow-up. Good thing it was added to my account immediately. 6. I encountered an error when I'm uploading my receipt and when it was submitted, the receipt was not complete. I snapped 3x but they only received one part of the receipt so they rejected my receipt because it was incomplete. I can no longer resubmit my receipt because it is already past the due date. So I have two receipts na nasayang. 8. I make sure to snap receipt every week so I can increase my level and I know that I'm already close to platinum level then out of the blue, I saw that I'm back to 33 weeks away to Platinum level, e few more weeks na nga lang ako. 9. I was downgraded because they failed to approve my receipt on that week. 10. They rejected my receipt stating that "receipt is older than 3 days" when in fact, I snapped my receipt on the day that I purchased it. It is not my fault that they check my receipt after one week. Even I reported the receipt, hindi pa rin nila nareresolve issues. So sayang ang points ko sa receipt. Well, this app may not be perfect but at least I know that it is legit. I was able to earn P200 by just snapping receipts. May pera sa resibo, so if you want to earn some money, download this app. Barya man yan, pera pa rin. I just cash out my points again and this time, it took them just a few days to deposit my money. April 19 - Received "Cash out completed" notification so I check my bank account and the money was credited. Because they reduced the Cashback Rewards, it took me a long time to hit P500+ points. I just hit cash out button and withdraw my P526.88 points and I was surprised when I checked my account online, they already deposited my cash rewards. Wow, that was fast. September 24 - Received the money in my bank account even without the app notification yet. I received an email stating that they will no longer give cashback per receipt. Instead of cashback, they will give coins that I need to use in Snaptastic in order to win cashback. I don't like the idea so I immediately withdraw the remaining balance of P363 (less P20 fee). Kung kelan naman na x2 na reward level ko, saka pa nila babaguhin. Hayz. Let see after March 5, pag hindi ko natuwa, I will delete the app na lang. Effectively starting March 5th 2019 at 00:00, all new receipt rewards will be changed from Cashback to Coins. The receipts snapped starting March 5th 2019 at 00:00 will earn Coins, and you will earn Cashback by spending Coins via Snaptastic. February 28 - P343 was credited in my bank account even without the app notification. This is interesting. This is the first time I read about this app. I will try this. Sayang din naman. I also collect receipts because I also keep tabs of our finances and Credit card expenses. Hi michi, I am using the same app and was happy about it. Always looking forward to snap. I actually had to endure 10 rejected receipts at first and sobrang frustrating hindi ko alam bakit when I snap the photo, hindi sya na snap ng buo. Kaasar lang. And yes, nawala din ang coins ko sometime ago. But.. I am still happy with it. Sino ba naman ang hindi you can get rebates with your receipts na patapon na sana diba? hehe. Hi Jen! Yes, nakakainis pag narereject noh or minsan naiinis ko sa malabo talaga na receipt (nagtitipid sa ink). Tama, sayang din yung rebates. It was also nilyn who told me about snap. I love it at first but just dont have the patience to retry taking photos of the receipt. Hihihi. I often get repeat taking photos because the first one was blurred or out of frame. But then, love the concept. Patience is a virtue. hehehe! Sometimes it is really hard to take good photos, may mga blurred din ako lagi. Currently I am using this app and I love it. Nakapag withdraw na ako ng 500 and looking forward na sana next month another 500 na naman. Yong resibo ko sa puregold laging rejected kasi sinusulatan ng guard pag labas kakainis hehe. Wow, laki na ng nakuha mo. I hope lumaki din ipon ko. True, sinusulatan nga ng ibang grocery. Next time, sabihin mo kay Manong guard, sa likod na lang magsulat. hehehe! Parang ayaw nila magpa cashout, i tried 2 bpi and 1 family savings, keeps. On getting rejected saying. Invalid account number. The support is responding pero make sure lang the acvt number is correctlagi sinasabi as if im that stupid to be wrong with my acct number x.x sayang ang naipong points. Aww, sayang nga. May voucher yata sila sa Zalora. Try it kaysa masayang points mo. Pahirapan na nga sa pag-ipon ng points.